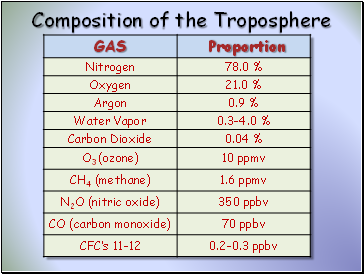 The troposphere contains approximately 80% of the atmosphere’s mass and 99% of its water vapor . 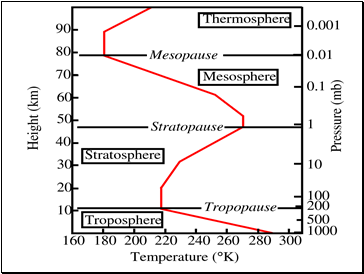 The stratosphere is actually increases in temperature as you move away from Earth. It also contains the ozone layer. 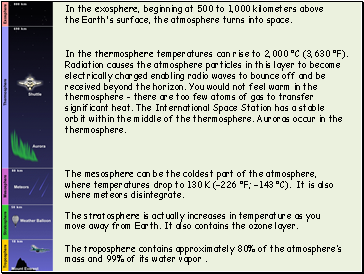 The mesosphere can be the coldest part of the atmosphere, where temperatures drop to 130 K (−226 °F; −143 °C). It is also where meteors disintegrate. In the thermosphere temperatures can rise to 2,000 °C (3,630 °F). Radiation causes the atmosphere particles in this layer to become electrically charged enabling radio waves to bounce off and be received beyond the horizon. You would not feel warm in the thermosphere – there are too few atoms of gas to transfer significant heat. The International Space Station has a stable orbit within the middle of the thermosphere. Auroras occur in the thermosphere. In the exosphere, beginning at 500 to 1,000 kilometers above the Earth's surface, the atmosphere turns into space. Ozone, O3, is a colorless gas. Chemically, ozone is very active; it reacts readily with a great many other substances. 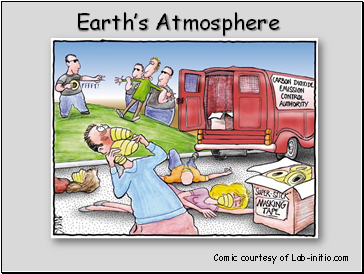 Near the Earth’s surface, those reactions cause rubber to crack, hurt plant life, and damage people’s lung tissues. 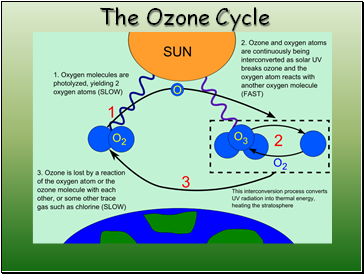 But ozone also absorbs harmful components of sunlight, known as “ultraviolet B”, or “UV-B”. 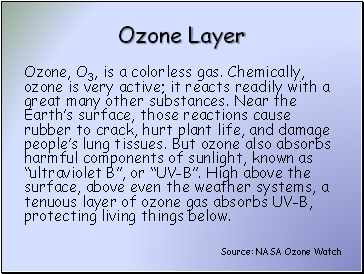 High above the surface, above even the weather systems, a tenuous layer of ozone gas absorbs UV-B, protecting living things below. 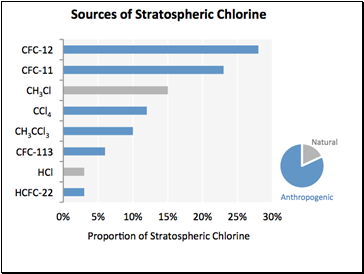 Small, mostly man-made organic molecules containing chlorine and/or bromine enter the atmosphere, and find their way to the stratosphere due to low reactivity. 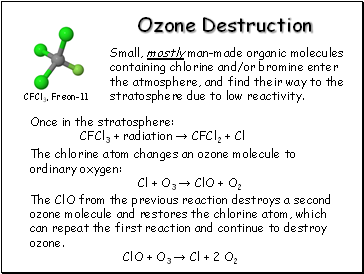 The ClO from the previous reaction destroys a second ozone molecule and restores the chlorine atom, which can repeat the first reaction and continue to destroy ozone.